Day House. July 1999 Photo by David Bangs. William Day worked on Mine Hill (Squak Mountain) during the boom times of Issaquah’s mining days. In 1914, he built this house for his son, Frank, and Frank’s new wife, Alberta. Their daughters June and Alice were born here. World War 1 took Frank to Alaska as a truck driver. To provide added income, Alberta converted part of the sweeping front porch into a bathroom and turned the spacious home into a boarding house. She lived in this same home until her death. Day Garage. July 1999 Photo by David Bangs. This house has had many occupants, A.P. 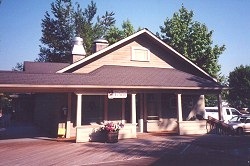 Burrows, founder of Issaquah’s first newspaper, The Issaquah Independent, built it for his family sometime between 1900 and 1912. 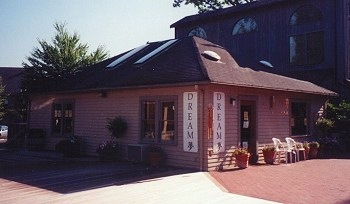 Soon after its completion, a Mr. DeChesne, a high school French teacher, his sister and mother rented it from Burrows. Two years later, Mr. and Mrs. Albin Ek took occupancy. 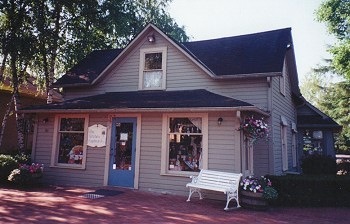 Ek ran a confectionery store in Issaquah until he volunteered for service in World War I. After he left, Mrs. Ek lived alone until 1917 when Ray Schneider, a former druggist from Iowa, took over the place, with his wife, Lena, while he worked for the First National Bank of Issaquah. The Burrows house was later occupied by a lumberman, Jay King, and then by Mr. and Mrs. Louis Podkranic. Mr. Podkranic’s sister-in-law, Rose Sellers, and her husband, Daniel Ralph, donated the home to Gilman Village. Lawrence and Lulu Smart lived in this garage in 1913 while Lawrence was building their new home. In 1914, they converted the building into a storage area for coal and wood and allowed enough space to park their Anderson, a stylish touring car, which was their first vehicle. Front view of the Smart House. July 1999 Photo by David Bangs. Lawrence and Lulu Smart owned this house from 1914, the year he built it, until the family fell on hard times during the Depression. Lawrence worked at the local milk canning plant, then called Alpine Creamery, now Darigold. In 1916, when Lulu got sick the couple moved in with parents on the Anderson Farm where Lake Sammamish State Park is now located. 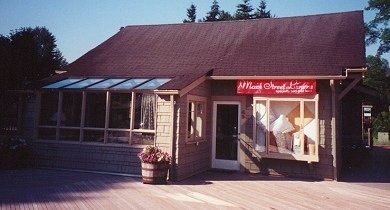 The Smart house was then rented to Leonard and Mary Miles, who ran the Red and White Grocery on Sunset Way. Later, the Smarts returned to the house only to leave again in 1927 when Lawrence inherited a farm in Fall City. The house was rented out until lost in foreclosure. In 1933, the new owner was Hugo Johnson, a mechanic for the Issaquah school buses. Side view of the Smart House. July 1999 Photo by David Bangs. Representing a type of architecture known as a “miner’s house,” this modest cottage is believed to have been built around 1910 by a Finnish carpenter. The house was first moved during a road revision and land exchange, ending up at what is now Front Street and Gilman Blvd. Located next door was the Huovar Motel. The Huovar family (parents John and Helja Huovar, and children John, Anita, and Lyllevan) lived in the home and operated the nearby hotel. The property was then purchased by Bill Skorp, who gave the house to Gilman Village in 1984. Lars Arndt Wold, his wife, Henrietta, and children Mary, Andrew, Ludwig and Sena, made their home here in 1908. 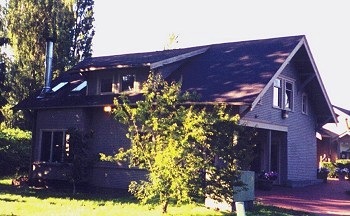 The house (called “The Wold” in the community) is the only building in Gilman Village which remains in its original location. 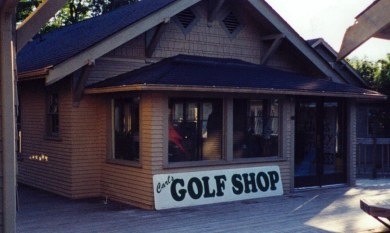 Except for the deck entrance, the exterior remains unchanged. The large handmade railings with the graceful curves were saved from the home’s interior. The Wold family was part of this corner of Issaquah for most of the century. The Wold daughters were active in the community. Sena was bookkeeper at the Standard Oil Bulk Plant and was known for raising police dogs. Mary was trained as both a teacher and a nurse. She served as a Red Cross nurse during World War I, in Siberia. One of the outstanding features of the home is its 70-year-old garden which remains intact in Gilman Village. The stonework pools done by “Uncle Carl”, the unusual plants such as cucumber leaf magnolia, atlas blue cedar, and Japanese red maples as well as the apple orchard all remain just as the Wolds enjoyed them. Part of a working farm is keeping the animals fed and healthy. The granary was the storage for feed for the family’s chickens which used to roam the orchard. 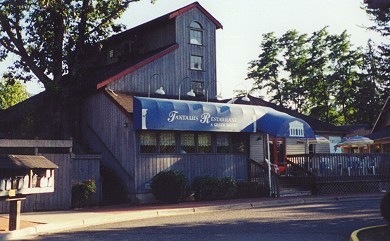 It stands in its original location. The Wold property itself is bounded on the west by Issaquah Creek. 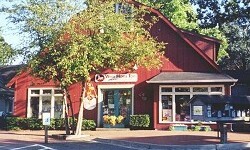 Though a little larger than when first built, the Wold barn is just a few yards from its home site. 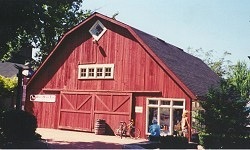 The barn was a 1908 project of the Wold family, pioneers of the Issaquah Valley. When it became part of Gilman Village in 1979 it was completely dismantled, moved, expanded, and reassembled using as much original material as possible. The architecture remains the same.